Confirmed: Ebay Acquires Milo For $75 Million. Investors Make A Killing. An update to our post earlier today: We’ve confirmed that local shopping startup Milo has in fact been acquired by eBay, for $75 million. Business Insider first reported on the possible deal earlier today. 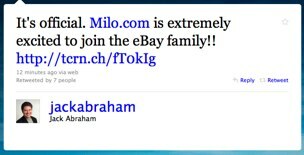 Milo CEO Jack Abraham confirmed the acquisition via a Tweet and eBay issued a press release. Investors in the company certainly did well. They raised just $5 million in venture capital. We’ve heard that True Ventures, which led the Series A round, owns some 25% of the company prior to acquisition. If accurate, they just pocketed nearly $20 million, a 10x or more return on an investment made a year ago. So what is Milo? Essentially the site lists real-time in-store product inventory for over 50,000 stores accross the country; featuring over 3 million products from Target, Macy’s, Best Buy, Crate & Barrel and more. The one problem Milo faces is that Google has started playing in the same space. Earlier this year, Google Product Search launched Blue Dot, on mobile search. Similar to Milo, Blue Dot allowed users within search to see if a product is in-stock at nearby stores. However, Milo countered back then that Google doesn’t have the inventory reach that Milo has. A few weeks ago, Google unleashed a new version of Product Search, with more inventory listings from 70 popular retail brands, many of whom also list with Milo. Milo struck back with a coupon feature and also previously launched an Android app, but having Google as a competitor is no doubt daunting for any bootstrapped startup. Especially in the search game. For eBay, Milo represents just another way to get into the $917 billion market of online research to offline buying. And Forrester estimates that this will eventually reach $1.3 trillion and account for nearly 50% of total retail sales by 2013.
eBay plans to bring the inventories of its sellers to Milo. The company will also integrate Milo’s local product feeds into both its online marketplace and mobile applications. eBay’s barcode-scanning iPhone application RedLaser will also feature Milo local results.